When I saw Michael Longuet-Higgins' Rhombo blocks at the Renaissance Banff meeting in Canada in August 2005, I just had to order two sets. I was wondering how they would fit on the bronze surface of my coffee table and was so pleased to discover that serendipitously they were almost a perfect match! (I mean serendipitous in the sense that Michael and I seemed to have each chosen more or less the same edge length.) Here are some photos to show you how nifty the fit is between the rhombo blocks and the bronze surface. 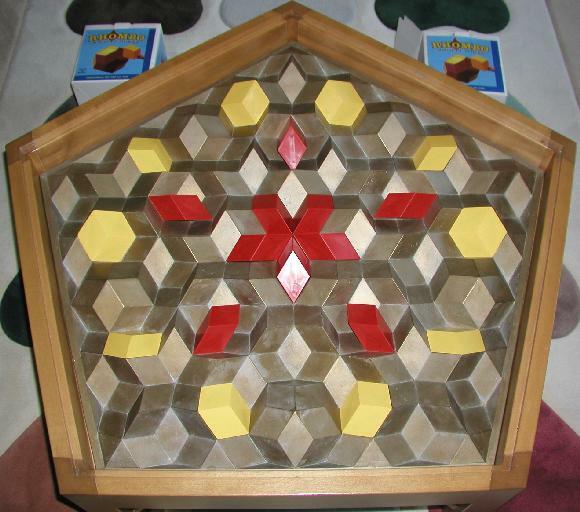 There are ten blocks in a set of rhombo blocks. Each block is a rhombohedron, which has six identical faces that are golden rhombuses. A golden rhombus is a rhombus such that the ratio of the lengths of the diagonals is the golden ratio, which is (1+sqrt(5))/2, or approximately 1.618. There are two different types of golden rhombohedra. You can bring the obtuse angles of three golden rhombuses together around one vertex, in which case you will get a rather flat rhombohedron. These are the yellow blocks in the set of rhombo blocks. Alternatively, you can bring the acute angles of three golden rhombuses together around one vertex, in which case you will get a rather pointy rhombohedron. These are the red blocks in the set of rhombo blocks. Five of each type of golden rhombohedron will fit together to form a rhombic triacontahedron, a convex polyhedron with 32 vertices and 30 faces, each of which is a golden rhombus. 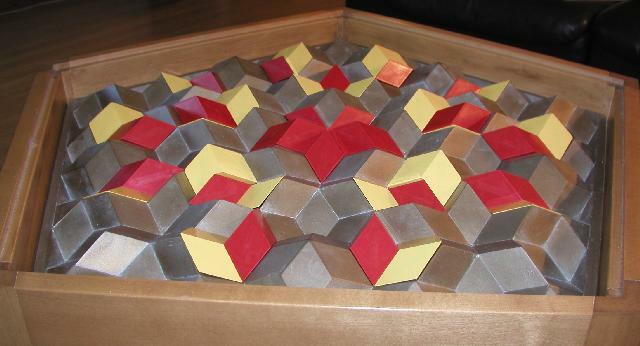 The first photo below shows how I arranged one set of rhombo blocks to sit atop the bronze surface. You can form more figures with two sets of rhombo blocks. 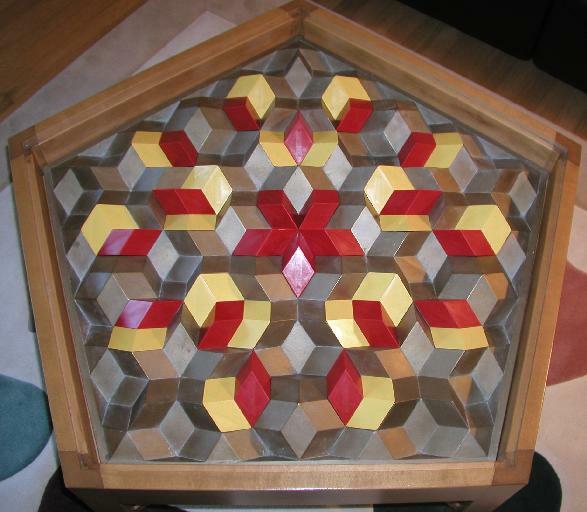 Indeed, if you take the ten pointy rhombohedra (the red ones), you can form what has been called the Kepler star. But of course, you can take all of the red and the yellow blocks from two sets of rhombo blocks and arrange them on my bronze surface. Below is one possible symmetric pattern. To get some idea what the surface looks like when you get your eye down to scan across the surface, see the photo below. A big thank-you to Michael for making the lovely rhombo blocks available to everyone! Let me also mention that the blocks are made out of a durable plastic with edges that are nicely finished. Each face has two small magnets attached to it on the inside of the block, so that the blocks stick together when assembled into an appropriate figure. Very neat! Copyright 2005, Greg N. Frederickson. Last updated October 3, 2005.